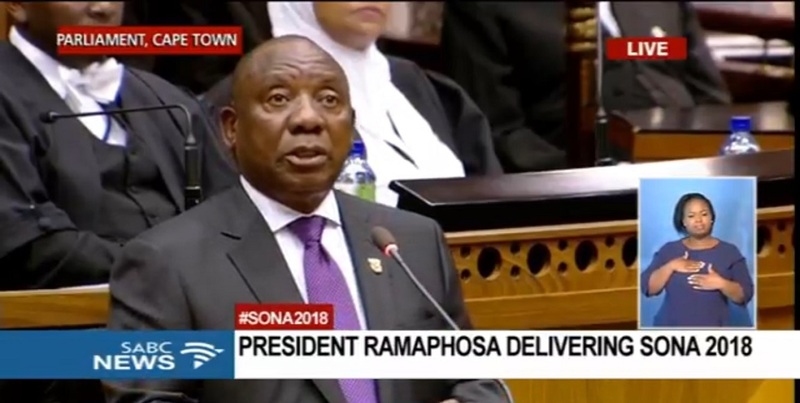 South Africaâ€™s fifth democratically elected president Cyril Ramaphosa had his inaugural State of the Nation Address on Friday night at the Parliament in Cape Town. The nation (at least those who hadnâ€™t opted for the Black Panther premiere instead) was glued to the television screens to witness what Ramaphosa would say and how he would distance himself from the turbulence that was the Jacob Zuma administration. For the first time in three years, the SONA also started without any interruptions. The Daily Vox team rounded up the biggest things from the 2018 SONA. The new president managed to immediately diffuse any tension in the chamber by starting off his speech with a joke for Economic Freedom Fightersâ€™ leader, Julius Malema, drawing a laugh from Juju. Ramaphosa began his speech invoking the memory of the first democratic president of the Republic of South Africa Nelson Mandela, saying that we are continuing the long walk he began, to build a society in which all may be free and equal. Importantly, Ramaphosa said we are building a country where a personâ€™s prospects are determined by their own initiative and hard work, and not by the colour of their skin, place of birth, gender, language or income of their parents. He also repeated that bit, interestingly enough, in Afrikaans. Outlining his plan to transformation the economy, Ramaphosa said industrialisation needed to be underpinned by transformation and the government would seek to develop a new generation of black and women industrial producers. He said radical economic transformation would require that the position of black women and communities are improved so that they can help to grow the economy. Ramaphosa said Zumaâ€™s free education plan would still be implemented, though he left the details to whichever person may deliver the budget speech next week Wednesday. In December Jacob Zuma announced that the government would be introducing free higher education and training for poor and working class South Africans. The President said the details of the financing would be clarified during the Budget speech while the Minister of Higher Education would be in charge of the implementation. So did you watch this yearâ€™s SONA? Has Ramaphosa convinced you that a new day is coming for South Africa? Comment below or tweet us. People often use lively vocabulary when they speak. Quotations allow you to place that lively terminology directly into your story.